The second-generation Traverse went on sale in the late summer of 2017, with the Enclave hit the showrooms in the fall of 2017. The 3.6L V6 combines with the smooth-shifting nine-speed automatic transmission to deliver urgent acceleration and serene operation. So serene that it seems like the engine has stopped, which it has because of the standard stop-start system. Unlike most other similar systems, GM's stop-start device cannot be switched off, which could be a deal breaker for some buyers. The electric power steering is precise, nicely weighted and has good directional stability at highway speeds. Braking is confident and the brake pedal location, feel and degree of travel needed to stop the car are all nicely judged; quite a change from GM cars of just a few years ago. The suspension reconciles ride and handling very well; the Traverse absorbs bumps adroitly and the vehicle feels solidly planted on the road. Despite its prodigious size, the Traverse actually drives smaller than it is. A towing package is standard on all but the base LS trim; with the V6 model rated for up to 5000 pounds (2268 kg). Solidly constructed, there were no squeaks or rattles noted on the two vehicles driven and road and wind noise are quite successfully suppressed. The interiors on GM cars have improved exponentially over the last five years or so and the cabin of the new Traverse reflects this great leap forward. The longer wheelbase combines with the XXL format to provide impressive room for a three-row CUV, maintaining one the greatest marketing features of the previous model. With pleasing shapes and attractive bright accents, the cabin of the new Traverse is quite elegant. While most vehicles in this segment feature soft-touch dashboard surfaces and door toppers, those of the Traverse are hard plastic painted with a low sheen paint. This move no doubt saves GM money on each Traverse sold and the finish looks so good that occupants won't notice unless they touch them. The interior of the new Traverse has a multitude of oddments storage to be the go-to crossover for vehicular hoarders. Front occupants are supported by substantial, supportive seats and enjoy abundant space. The individual second row seats are comfortable, can be moved forward and back to furnish greater legroom for third-row seat riders and have enough space between them to let third-row riders pass easily to the third row. Though the space and comfort of the third-row seat can't compare with those available in a minivan, it is good for this type of vehicle and adults can easily tolerate a cross-town hop back there. The cargo bed is a full four feet (1219 mm) wide; easily accommodating standard building materials and offers best-in-class cargo capacity for a three-row CUV. The cargo floor cover can be flipped up, liberating a great deal of vertical space. After nine long years on the market, Chevrolet has finally released its second-generation Traverse. 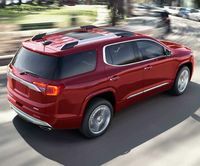 Many buyers viewed the previous Buick Enclave, Chevrolet Traverse and GMC Acadia as a monobloc of vehicles, so GM has taken great pains to create marketing space between them for their replacements. So much so that the three cars were released at different times and the GMC Acadia, which went on sale a year ago, was actually shrunk to be a direct competitor with big volume three-row CUVs like the Ford Explorer and Toyota Highlander. The on-sale-now Traverse and soon to be released Buick Enclave retain the XXL format. About the same length as its predecessor, the latest Traverse is built on a 2 inch (51 mm) longer wheelbase which permits more legroom, especially in the last two rows. Like many new vehicles, the platform of the new Traverse is a bit more rigid than before and the vehicle is roughly 330 pounds (150 kg) lighter than the vehicle it replaces. While there were 135 trim variations available to Traverse buyers in 2017, Chevrolet has reduced the number of possibilities down to 11 for 2018. With centre row bucket seats, most Traverses will be seven-seater this year; but the base LS trim and one version of the LT seat eight. New for 2018 is a sporty themed Premier Redline trim with black-out trim and wheels and a new range-topping High Country, which explores the limits of what buyers are willing to pay for a Chevrolet. Though GM's ubiquitous 3.6L V6 will power most Traverses, Chevrolet is testing the market for a smaller engine with a 2L turbo four that produces 255 horsepower and a stout 295 lb-ft of torque. Power finds its way to the wheels via a nine speed automatic transmission in all cases. Front-wheel drive is standard, with all-wheel drive, optional. Most models offer an optional all-wheel drive system with Normal, 4x4, Off-Road and Tow-Haul modes; with the High Country employing a more sophisticated set up with torque vectoring delivering greater stability in challenging driving situations. The electric power steering in the new Traverse will help the driver counter a skid and corrects for both side winds and heavily crowned roads. Active safety is taken care of with available adaptive cruise control with all-speed forward automatic braking including front pedestrian braking. Lane departure, blind spot and rear cross traffic warnings and lane keep assist are also available. All trims are equipped with a rearview camera; with fancier variants featuring a 360 degree bird's eye view. A new feature alerts the driver if a person is left in the car after it is locked. Infotainment equipment for 2018 includes GM's excellent IOS/Android interface that lets the driver's cell phone take over the dash centre screen as well as standard in car WiFi. The new Enclave follows the same basic styling themes of its predecessor, but is a less fussy design and looks sleeker and more athletic. The new Enclave’s cabin is a strikingly simple design with a serene ambiance. The first and second row seats are sumptuously supportive and occupants have room to stretch out. The third row seat is comfortable enough, with good legroom and cargo space for the class. Only one powertrain, a 302 horsepower 3.6L V6 hooked up to a nine-speed automatic, has been announced. All-wheel drive, standard on LT True North, Premier, Redline and High Country models, is a $3000 option on the LS and LT Cloth trims. With alloy wheels, auto climate control and xenon headlamps, the $36,790 front-wheel drive Traverse LS base model is well equipped for the money. The LT Cloth upgrade, with a power driver's seat, heated front seats, satellite radio, power tailgate, blind spot and rear cross traffic warnings and a tow package, is very good value. The LT True North model reconciles price and content quite well but the supplement to migrate from there to the Premier is very high and the price gulf between the Premier and the High Country is roughly twice the value of its additional equipment. The Traverse is an exceptional lease value for 2018. All-wheel drive, is a $3000 option on the Essense trim but is standard on the Premier and Avenir models. The Premium model balances price and value precisely but migrating to the Avenir range-topper costs about twice the value of its additional content. The Enclave is priced from $3000 to $13,000 higher than a similarly equipped Chevrolet Traverse. New model, not rated. The previous models were rated below average for reliability. The electrical system of the was prone to electrical glitches. The previous version of the 3.6L V6 suffered from defective timing chains which let to all sorts of issues. A GM extended warranty recommended if you plan to keep these vehicles past the warranty period. An auto-fill alert will let owners know when a tire is properly inflated, is standard on all trim levels. A heated steering wheel that turns on automatically when sensors determine it is necessary is standard on the Denali range-topper this year. Built on a 164 mm shorter wheelbase, the new Acadia measures 184 mm less from stem to stern, is 87 mm narrower, 99 mm lower and about 300 kilograms lighter than its predecessor. GM is unconcerned about giving up its unique "Midsize-Plus" sales position held by the previous Acadia in a move to engage the wider mid-size CUV market. 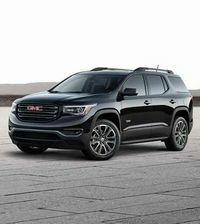 The new Acadia looks like a slimmed-down, modernized version of the original Acadia's predecessor, the body-on-frame GMC Envoy XL. The Acadia's cabin is attractive and well constructed. Cabin space is less than before, but similar to that offered by major competitors in the mainstream mid-size CUV market. GM's 3.6L-V6, now with direct injection, powers most Acadias, but GM offers its familiar 2.5L four for those seeking additional fuel economy. The Acadia is equipped with an auto start/stop system designed to safe on fuel in heavy traffic conditions. Front-wheel drive is standard, with all-wheel drive optional. 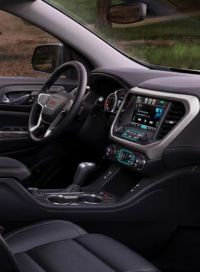 GM contends the All-Terrain variant of the premium Denali trim level has off-road capabilities beyond that of mainstream all-wheel drive versions of the Acadia. Available active safety equipment includes low speed forward auto braking, forward auto braking, forward collision alert, lane keep assist and blind spot, rear cross traffic and lane change alerts. Driven briefly, the Acadia Denali, with a punchy, silky V6, slick shifting six-speed automatic transmission, nicely weighted, precise steering, firm brakes and a very well judged ride-handling compromise for a family bus, is another 'no excuses' vehicle from General Motors. With clear gauges and logical controls, comfortable seats and attractive components, the Acadia's cabin is a pleasant place to spend time in. 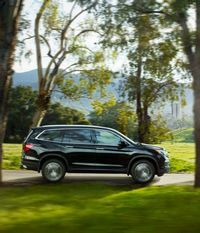 Despite its smaller size than its XXL predecessor, the Acadia is roomy in the first two rows of seats and offers competitive space for those in the third-row seat. Cargo space is typical for this class. All-wheel drive, standard on most trims, is a $3000 option on the SLE1 and SLE2 trims. The SLE1 employs the base 2.5L four with other trims powered by a 3.6L V6. Migrating from the SLE1 to SLE2 is very expensive but does include the V6 engine. Moving up to the SLT1 from the SLE2 is good value and the SLT2 trim is priced to reflect the value of its additional features. The Denali trim is overpriced. New vehicle, not rated. The previous Acadia et al were rated below average reliability. The electrical system is likely to develop glitches. Numerous complaints have been received regarding defective timing chains on the 3.6L V6 used in the previous version of this vehicle. An extended warranty from GM is recommended if you plan to keep this vehicle past the warranty period. Active Safety Features: Available active safety equipment includes low speed forward auto braking with pedestrian detection, forward auto braking, forward collision alert, lane keep assist and blind spot, rear cross traffic and lane change alerts. A 6.4L SRT is new. V8 powered Durangos are fronted by a different front fascia with a lower valance than V6 trims. An updated Uconnect system, Sirius XMGuardian and 4G Wifi are all new for 2018. 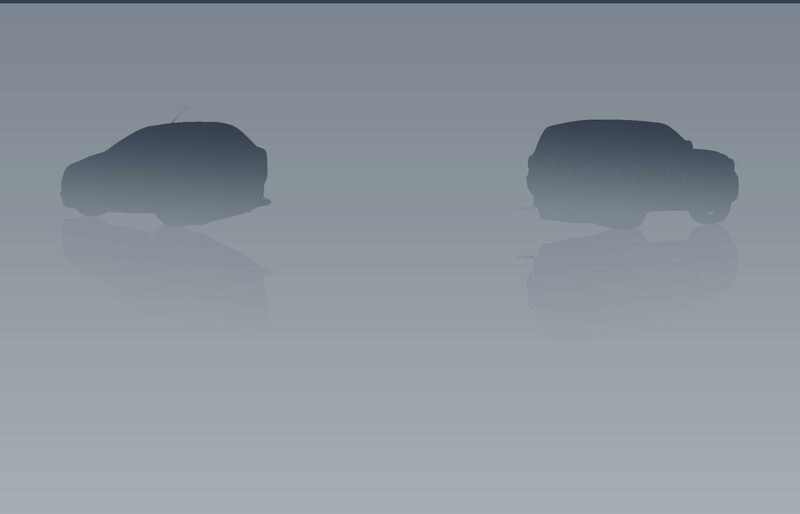 The GT trim now features a power tailgate and the R/T, Citadel and SRT models are equipped with front parking sensors. Numerous minor trim updates. Hooked up to an eight-speed automatic transmission, the Durango's 3.6L V6 delivers good urge with impressive refinement. The Hemi V8 is quick and generally smooth, but equal numbers of people like or loathe the prominent V8 burble at low speeds. Precise steering and a well-judged ride-handling balance. The all-wheel drive system is remarkably well sorted. The cabin is quite well done, with tastefully conservative design and decent materials. Comfortable seats and plenty of room up front and good room in the third row, but the second row seats, which can't be moved fore and aft, have just adequate legroom. Abundant cargo space with the third-row seat folded but storage space is tight with the third row seat arrayed to take passengers. Based on the same platform as the Jeep Grand Cherokee, the Durango is built on a longer wheel base and has a third-row seat. Styling, with a hint of the first Durango in its flanks, is very clean and shares no panels with the Grand Cherokee. Chrysler’s Pentastar V6 produces 290 horsepower in this application, with a 5.7L V8 optional. Power reaches all wheels via an eight-speed automatic transmission regardless of the engine. Unlike its Jeep Grand Cherokee showroom mate, the Durango does not need to be "Trail Rated", so it is tuned for on-road use and drives with more precision. Properly equipped, the Durango V6 can tow up to 2812 kg (6200 lbs), with the V8 rated for up to 3266 kg (7200 lbs). Well-equipped base SXT trim. The GT trim is priced $5000 higher than the SXT but brings along roughly $6000 worth of equipment. The top V6-powered trim, the Citadel, is priced to reflect the value of its additional features. Compared with the V6-powered GT, the additional equipment of the V8-engined R/T could justify its additional price based on equipment alone but you get the V8 engine essentially as a bonus. The new 6.4L SRT range topper is priced $15,000 higher than an R/T. With roughly $3000 of the additional price for the SRT attributable to additional equipment, the value of the bigger engine is about $12,000. Not rated, insufficient data. The Durango V6 and transmission are unproven. Edge: new Sport trim and Safe and Smart package. 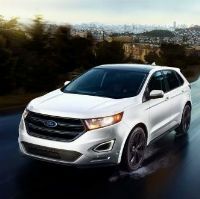 Ford has shown a facelifted 2019 Edge but it won't go on sale until the fall. Our Sport model, powered by a turbocharged 2.7L V6 that produces 315 horsepower and a stout 350 lb.ft. or torque, needed just a wisp of throttle to get the Edge moving quickly, which is a good thing as its punchy, flexible, all-conquering V6 lacks a compelling soundtrack when extended. Fuel consumption of 10.6L/100 km, admittedly mostly on the highway, is impressive for a vehicle of the Edge’s girth, accommodation and speed. The Edge’s six-speed automatic transmission always seems in the right gear and works unobtrusively. The Edge’s steering requires just the right amount of effort, is nicely geared, sends road surface information up to the steering wheel and makes maintaining a steady course at highway speeds an easy task. With firmer suspension settings and sports car-like P265/40R21 tires, the Edge Sport handles crisply with very little lean and feels incredibly planted at all speeds. The Edge rides firmly but has amazing compliance and never jolts occupants regardless of the road surface, a hard thing to do with sports car-like low-profile tires. With great pedal feel and no lost motion, the Edge’s brakes are as confidence-inspiring as they are powerful. Other than an engine that sounds a bit gruff when really pushed, the Edge is an impressively refined vehicle. Big windows and a straight window line between the windshield and tailgate combine to provide all occupants with a good view out, unusual in this vehicle segment. Multiple cameras, including one for the front of the vehicle, make the Edge easy to park in a tight spot. 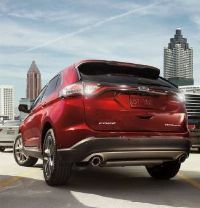 The Edge’s rear-cross traffic feature, packaged along with a blind-spot warning system, is a major safety plus, alerting drivers to approaching vehicles while reversing. Drivers face the universal instrument package employed by all Ford products equipped with its MyFord Touch integrated infotainment system. A conventional centre speedometer is flanked by configurable electronic readouts. The MyFord Touch, four tab info screen resides in the top centre of the dashboard. 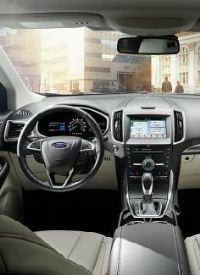 Unlike some of Ford’s previous MyFord Touch equipped vehicles, most climate and audio functions can be manipulated by conventions buttons and knobs. Controls are relatively straightforward despite the multiple features they operate. The Edge’s cabin is a vision of conservative good taste that is carefully assembled from very attractive components. The faux alloy accents are particularly well done and the leather and Alcantara upholstery is very elegant. The Edge’s seats are large, supportive and very comfortable on a long run. Rear seat riders will find that a supportive seat combines with ample legroom are most welcoming. The cabin is stocked with a multitude of cupholders and storage cubbies. Cargo space is long, wide and deep with the rear seats in place, increasing substantially with them folded flat. The Edge’s strong air conditioner cooled the car quickly and kept occupants comfortable during the sultry conditions experienced during our time with the Edge. The three-setting cooled front seats on our Edge were a real treat. 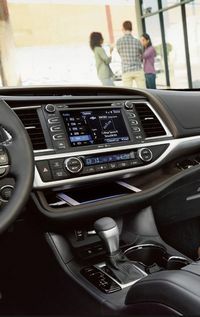 The Edge’s Bluetooth system hooked up easily, its audio system was a sonic delight and its navigation system was a boon when driving in unfamiliar locales. 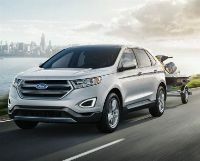 Ford claims the 2L turbo four is all-new compared with the 2L turbo four used in the previous Edge. The 2L is standard on all trim levels except for the Sport, which is powered by the new 2.7L V6 turbo exclusively. The returning 3.5L V6 is not offered on the SE but is optional on the SEL and Titanium. All-wheel drive is standard on the Sport model and optional on other trims. The sole transmission is a six-speed automatic. All-wheel drive, standard on the Edge Sport, is a $2000 option on all other trims. A normally-aspirated 3.5L V6 can replace the 2L turbo four for just $500 on the SEL and Titanium trims. Migrating from the SE to SEL and from the SEL to Titanium are good value. The Sport, powered by a 2.7L turbo V6, is priced $4000 higher than a V6 all-wheel drive Titanium; about $500 of it represents addition equipment, the rest can be attributed to the engine. Based on the Ford Fusion which is rated average overall. Some expensive engine failures on the 2L turbo four and the 2.7L V6 turbo is unproven. Additional airbags: Available passenger side glovebox airbag. 4G Wifi is now available as is a Safe and Sound package. The 3.5L V6 is quick and refined. The new turbo four is quick but is unrefined and is not demonstrably more economical than the V6. Smooth automatic transmission. Astonishing ride/handling balance for such a large vehicle. Light but precise steering. Strong, progressive brakes. The small glazed area restricts outward visibility. Good cabin fit and finish, but the dark cabin colours (including a black headliner), makes for a grim cabin ambience. Comfortable front seats. The middle-row seat has limited legroom and an uncomfortable centre seating position. The third-row seat has reasonable space for short hops. Ingress/egress is hampered by the Explorer's great height. Impressive cargo space with the second seat in place, with reasonable room remaining when the third-row seat is arrayed for passengers. Clear gauges. A 3.5L V6 is standard, with a 2.3L turbo four and a 3.5L-V6 turbo, optional. The four-setting (normal, mud/ruts, sand, and snow) All-Terrain system alters performance parameters to match surface conditions. Properly equipped, the Explorer can tow up to 2268 kg (5000 lbs. ), an impressive weight for a unibody CUV. All-wheel drive, standard on the Limited, Sport and Platinum trims, is a $3000 option on the base XLT version. The 2.3L turbo four, standard on the Limited, is priced $1000 higher than the V6 on the base XLT trim. The 3.5L turbo V6 is standard on and exclusive to the Sport and Platinum trims. The XLT trim is good value but the Limited and Platinum trim are overpriced. The Sport is priced about $4300 more than a Limited; with about $1300 attributed to the engine and the balance related to additional equipment. The Platinum, equipped with a turbo V6 is very comprehensively equipped but expensive. At $1195, the Smart and Safe package offers a comprehensive suite of active safety features for not much money. Not rated, insufficient data on this model. An extended warranty from Ford is recommended. Unproven turbo engines. Active Safety Features: Available blind spot and rear cross traffic monitors and well as adaptive cruise control with collsiion warning monitor. No changes of note for 2018. 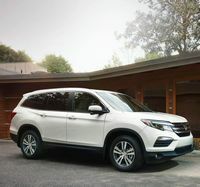 Unlike its rather utilitarian-looking predecessor, the Pilot is more elegant and upscale this time and ready to do battle with competitors like the ever-popular Toyota Highlander. The Pilot driver faces a peanut shaped instrument cluster with half-circle tachometer on the left side, a quarter circle fuel and temperature gauges on the right side, separated by a crisply-marked electronic info centre which is topped by a digital speed indicator. The centre of the dash is dominated by the HondaLink info touchscreen that controls all aspects of the audio and navigation systems. Like in other Hondas, HondaLink, with no knobs for volume or tuning, is not really suited for in-car use. Relatively conventional climate controls reside under the info screen. With plenty of matte-finished soft-touch surfaces, the new cabin of the new Pilot is a huge improvement over its predecessor. Trim levels with leather upholstery look quite elegant but the fabrics used in lesser models are a bit dour, especially in this price bracket. Big, supportive and comfortable, the Pilot's front seats are up to the high standard set by large Honda vehicles over the years. The second-row seats are comfortable and passengers enjoy good legroom. The third-row seats allow reasonable access and offer acceptable space for smaller, agile passengers. Cargo space is ample when the Pilot is in two-row mode and while not expansive when the third-row is deployed, it offers more space than on the last Pilot and better than most three-row CUVs. The Pilot's 3.5L V6 is smooth, strong and flexible. The nine-speed automatic transmission on our Touring model harnessed the V6's energy very well and permitted low-rev cruising. Steering is accurate, nicely weighted and geared but not the last word in road feel. Handling is steady and secure and the Pilot's ride is nicely absorbent. The Pilot stops quickly enough but the pedal feels soft and pedal travel is longer than necessary. The Pilot's air-conditioning system worked hard to keep passengers cool during some hot weather and the in-dash turbulence generated inside the dashboard when the rear seat ventilation system is deployed is such that some potential buyers may find it to be a deal breaker. Despite its poor controls, the audio system has a pleasing sound. Active safety equipment such as lane departure warning, forward collision warning with mitigation braking, adaptive cruise control and blind-spot and rear cross-traffic monitors, are available. The base LX trim is very nicely equipped. The EX trim upgrade, which includes a power driver's seat, roof rails and a sunroof, is equipped to suit the wish lists of most buyers and is good value. The EX-L trim, with leather seating and navigation, reflects the value of its additional equipment. The EX-L RES, which replaces the navigation system with a rear entertainment system, is priced to account for its additional features. The range-topping Touring trim is very nicely equipped but is overpriced. 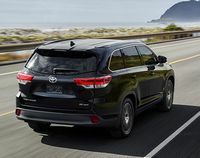 Like its chief rival, the Toyota Highlander, the Pilot is generally hard to find, especially if you are looking for a heavily optioned version. There are few discounts available on the Pilot. Very good value leasing. New vehicle, not rated. The previous Pilot was rated above average with cautions regarding ling-term engine and transmission durability. Nine-speed automatic transmission is unproven. Some reports of front suspension clunks and premature brake rotor wear. Active Safety Features: Active safety equipment such as lane departure warning, forward collision warning with mitigation braking, adaptive cruise control and blind-spot and rear cross-traffic monitors, are available. Compared with the two-row Santa Fe Sport, the XL has 100 mm more space between the front and rear wheels and is 215 mm longer overall. The XL's cabin is very elegant and could teach a lot of 'premium' manufacturers a thing or two about design as well as fit and finish. Clear instruments and logical controls make the XL easy to deal with. Occupants in the first two rows sit on comfortable, supportive seats and enjoy generous legroom. The third-row seat, like those of many competitors, is made for the young and supple. Cargo space is good with the third-row seat folded but available space shrinks considerably when the third-row seat is deployed to accept passengers. The XL is powered exclusively by a direct-injected 3.3 V6 with 290 horsepower. Power reaches the wheels via a six-speed automatic transmission. Except for the base FWD model, all XLs feature all-wheel drive. The V6 is smooth, punchy and offers strong performance. The six-speed automatic upshifts seamlessly and reacts promptly to downshift requests. The XL's steering lacks road feel but is nicely weighted and geared. In contrast with the Santa Fe Sport which exhibits a ride that veers toward excessive compliance, the XL's suspension is firmer and its handling is crisper than its somewhat wallowy stablemate. Like many vehicles of this type, exterior vision could be better. Very good audio system on the Premium model tested. All-wheel drive is standard on all but the base trim level, where it is a $2000 option. Good value Premium trim level includes features such as a power driver's seat, heated rear seats and leather wraps for the steering wheel and shift knob. The Luxury trim, with leather seating, navigation and a panoramic roof, is excellent value. The supplement to move up from the Luxury to the Limited trim balances price and content precisely. The Ultimate trim, the only way to get active safety features such as adaptive cruise control, is overpriced. Average reliability predicted. The previous Santa Fe was not trouble free and there were some corrosion issues as well. G-Verctoring control, which actively assists handling, is standard on all models for 2018. Mazdas i-Activesense safety suite now includes radar cruise stop and go as well as pedestrian detection, is now optional on the GS and GS-L trims. The GT model now includes the features standard on the previous Technology trim as standard. Numerous detail package and packaging changes. The new CX-9 is an elegant, luxurious and well-constructed vehicle. It's turbo four is quick and flexible, but the lack of engine refinement when accelerating hard could be a deal breaker for some buyers. Combined overall fuel economy of 12.4L per 100 kilometres in moderate summer weather is not that impressive considering the operational refinement drivers are giving up. Like other current Mazdas, the new CX-9 has precise, nicely weighted steering and a ride handling balance that combines a firmly compliant ride with crisp handling. The driver faces clearly marked, traditional gauges and controls for audio and climate functions are straightforward, even though the climate controls are hidden away at the base of the dash centre stack. The front compartment is dominated by a massive, and very high centre console which is meant to replicate the intimacy of a sports cab cabin. It looks great, but makes drivers feel hemmed in. The front seats are comfortable enough but a lack of vertical and pitch adjustment makes attaining a comfortable driving position difficult. The large-dimensioned middle row seat is sumptuously comfortable and occupants enjoy expansive legroom. Like most three-row CUVs, the last row seats are best for children or for short hops by adults. The CX-9's cabin is very elegant and constructed from very attractive components. While long and wide, cargo space is somewhat limited by its shallow height between the cargo floor and the window line. Mazda, who sold the Ford derived first-generation CX-9 for a very long time, finally released its all-Mazda three-row CUV in the summer of 2016. Without a V6 in its arsenal and with an eye on the previous U.S. fuel economy regulations, Mazda elected to power the new CX-9 with an in-house turbo four. Most buyers will choose all-wheel drive but the base CX-9 is offered with front-wheel drive, partially to be able to advertise the lowest possible MSRP. All-wheel drive is standard on all models except tor the GS, where it is a $2500 option. Most buyers will find the GS-L, with leather seating, a sunroof, heated rear seats and steering wheel, power tailgate and front passenger seat and Keyless Go, to be an excellent balance of features and price. The i-Activesence package, with radar cruise with stop and go, pedestrian detection, smart city brake support, forward collision and lane departure warnings as well as lane keep assist, is a 900 $ bargain in the GS and GS-L models. With navigation, a branded audio system with satellite radio, head up display parking sensors and alloy cabin trim, the GT trim is well priced. The Signature range-topper is expensive for what it offers over the GT. Not rated, new model. Mazda's previous turbocharged engines have been unreliable so an extended warranty is recommended if you place to keep the car past the five year mark. Active Safety Features: Available foward collision, blind spot and lane departure warnings. Available active cruise control with "Smart City" low-speed 4-30 km/h brake support as well as "Smart" brake support for 15-145 km/h speeds. Lane Keep Assist is also available. Autonomous emergency braking is standard on all models. The SV Tech trim, with navigation, active cruise control and a remote starter, replaces the previous SV model. The SL Premium trim supplants the SL trim offered last year. The Midnight edition with black-out trim is offered on the SL Premium model. The Pathfinder's strong 3.5L V6 provides effortless acceleration, good refinement and reasonable fuel economy for a leviathan. Well-matched to the V6, the Pathfinder's CVT operates unobtrusively. The Pathfinder's steering is nicely weighted, but a bit slow and lacks road feel. Though it leans more lean in curves than other vehicles of its type, the Pathfinder has a supple ride that many drivers may find more pleasing than crisper handling at the expense of ride comfort. Nissan uses the same elegant, precisely marked gauge package used in the related Altima. Logical controls, especially considering the multiplicity of tasks requiring manipulation. Substantial, supportive front seats. Though mounted a bit too close to the floor, the second-row seats are comfortable and fold in such a way as to permit easy access to the third-row seats, which, like most vehicles, are meant for supple pre-teens. Cargo space, ample with the vehicle in two or five-seat modes, is significantly diminished with the third-row seat deployed for passengers. Front-wheel drive and all-wheel drive variants of the Pathfinder are offered for 2017. Properly equipped, Nissan gives the Pathfinder a towing capacity of 2720 kg (6000 lbs. ), but heavy loads may compromise the durability of the CVT. All-wheel drive is standard on most trims but is a $3000 option on the base S trim. Moving up from the S to the SV trim offers excellent value and migrating from the SV Tech to the SL Premium model is good value. The Midnight Edition package offered on the SL Premium trim, is priced to reflect the value of its additional features. The Platinum range-topper is overpriced and offers very little of real value compared to the SL Premium model. Not rated. Predicted reliability is average at best. CVT durability not proven in high-power applications such as the Pathfinder and durability may be further compromised if the vehicle is used for towing. Some V6 engine failures reported; please adhere to Nissan's oil change intervals. An extended warranty from Nissan recommended. Active Safety Features: Available blind spot and rear cross traffic warnings. No changes of note for the fifth, and likely last year for the Highlander in its current form. Excellent drivetrain. The 3.5L V6 is quiet, smooth and quick. Refined, economical hybrid. Very carefully judged ride-handling compromise for a family hauler. Overly light steering. Very comfortable seats and abundant space in the first two rows, with third row seating one of the best in this segment. Elegant cabin fronted by a dashboard with clear gauges and logical controls. The interior features attractive, carefully assembled components. Ample cargo space. 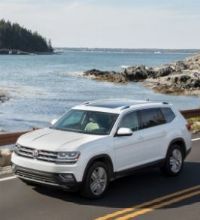 The Highlander was judged the best vehicle in an APA group test that also included the Hyundai Santa Fe XL and the Dodge Durango. The Highlander's cabin is attractive and carefully assembled. With a three-passenger third-row seat, the Highlander can now accommodate up to eight people. The Highlander has been is short supply since its launch in 2014 and the situation has remained unchanged since then. All-wheel drive, standard on the XLE and Limited trims, is a $2495 option on the base LE model. The LE Convenience package is a bit overpriced but contains a lot of equipment buyers are keen on and represents the best value of the lineup. The XLE and Limited upgrades are good value if you like their features. Compared with the XLE, the SE package lacks value. Hybrid: All-wheel drive, with the rear drive being electric, is standard on the Highlander hybrid. Moving up from the XLE to the Limited trim is good value this year. The hybrid variants are priced about $6000 higher than the same trim level of conventional all-wheel drive Highlanders. Good value leasing. Predicted above average reliability, including the hybrid, which uses proven technology. Active Safety Features: Collision prevention system with pedestrian detection. Lane departure, blind spot and rear cross traffic warnings. All new three-row Volkswagen built in the United States. 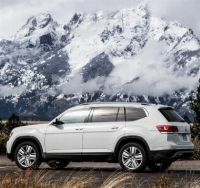 After a long period sitting on the sidelines while other carmakers booked increasing sales of three-row CUVs, especially in the U.S. where this segment sells in robust numbers, Volkswagen has finally released its three-row Atlas. Built on VW's variable MQB architecture, the Atlas is built alongside it in Chattanooga, Tennessee. Like the Passat, the cabin of the Atlas is very functional but lacklustre, and interior materials, once a Volkswagen drawing card, are class average at best. However, the seats are comfortable, space is abundant in the first two rows, with competitive room for third-row occupants. Cargo space is generous in two row mode and typical for the class when seven passengers are being carried. 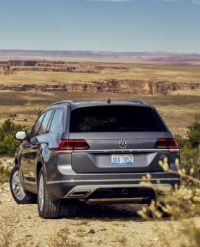 Front-wheel drive variants are powered by a 2L turbo four with 235 horsepower; a 276 horsepower 3.6L VR6 is employed on Atlas models equipped with VW’s 4Motion all-wheel drive system. What the Atlas lacks in exterior styling and cabin ambience, it more than makes for in terms of driving dynamics, room and comfort. Tested with the V6 and an eight-speed automatic transmission, the Atlas is both quick and quiet. The nicely weighted steering is precise and even offers a modest amount of road feel. The Atlas handles with confidence and delivers a supple ride. Braking is strong with good pedal feel and no lost motion when you request a stop. The audio system is a delight in the range-topping vehicle driven by the APA. A full suite of active safety features is available on the Atlas, which also offers a Post-Collision system that maintains braking force once the airbags have been deployed. The base Atlas is nicely equipped but moving up from the Trendline to the Comfortline is, with forward collision warning, pedestrian warning, remote start, keyless go, blind spot-rear cross traffic warnings and upgraded audio equipment, very good value. Compared with an all-wheel drive VR6 Comfortline model, the Highline, with a large format sunroof, navigation, leather seating, heated rear seats, heated rear seats and a power tailgate, is a bit of a bargain if you like its equipment. The VR6 all-wheel drive powertrain is standard on the Highline and a $4100 option on other trims. New model. Not rated. Predicted reliability is average for the first three or four years, declining after that. Active Safety Features: Adaptive cruise control with stop and go, blind spot and rear cross traffic warnings.